Tayebeh, F., Nazarian, S., Mirhosseini, S., Amani, J. (2017). Novel PCR-ELISA Technique as a Good Substitute in Molecular Assay. Journal of Applied Biotechnology Reports, 4(2), 567-672. Fatemeh Tayebeh; Shahram Nazarian; Seyed Ali Mirhosseini; Jafar Amani. "Novel PCR-ELISA Technique as a Good Substitute in Molecular Assay". 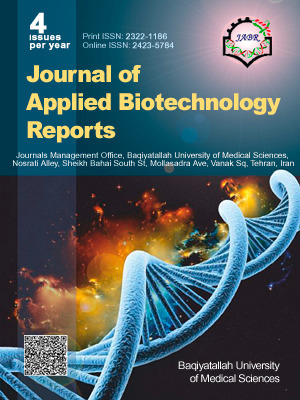 Journal of Applied Biotechnology Reports, 4, 2, 2017, 567-672. Tayebeh, F., Nazarian, S., Mirhosseini, S., Amani, J. (2017). 'Novel PCR-ELISA Technique as a Good Substitute in Molecular Assay', Journal of Applied Biotechnology Reports, 4(2), pp. 567-672. Tayebeh, F., Nazarian, S., Mirhosseini, S., Amani, J. Novel PCR-ELISA Technique as a Good Substitute in Molecular Assay. Journal of Applied Biotechnology Reports, 2017; 4(2): 567-672. Due to the spread of infectious diseases, the existence of a rapid and sensitive detection method is necessary today. Polymerase chain reaction-enzyme linked immunosorbent assay (PCR-ELISA) is a simple manner for detection of microorganism. For example, bacteria, viruses, fungi and others based on nucleic acid sequence. A large number of samples can be screened by this technique simultaneously, so it is not time consuming and is a quick manner. The high sensitivity and specificity of PCR-ELISA make it a powerful technique by simple laboratory facilities. As a result it can be an excellent substituted manner for analysis and detectionin different various fields.